09.09.09: “No. 9” indeed. 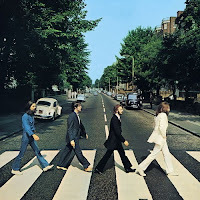 It’s as if the date was predestined, its significance anticipated over four decades ago on The Beatles, aka the “white album.” Today is the day of The Beatles on Rock Band, coinciding with the (re)release of remastered versions of Beatles’ albums on CD. In addition, there has been widespread speculation that today may see the announcement that the Beatles catalog shall finally be available on iTunes, even though all four of the band members have solo material in the store available for download already. The marketing apparatus has attributed to the date a significance as profound as occultists do the date 2012, as if the human calendar, for the past few hundred years comprised of twelve months and 365 days—save when leap year makes it 366—is linked to events in nature—indeed, all across the universe. Hence today is to feel “historic,” a momentous day that occurs only once in a lifetime, nature and culture coinciding with all the awe and mystery of a planetary alignment: the Beatles remastered, on Rock Band, and perhaps, God willing, even on iTunes. All of this on a Wednesday, too, even though new releases typically occur on Tuesdays: presumably, the event is so unique that it must occur outside a normal routine, a predictable and banal cycle, and be set aside on a singular day and date, a calendar event so fraught with the aura of magic (and the mnemonic properties of an incantation) - 9.9.09 - that only something utterly singular and profound may occur. Of course, despite all the media hype, what today’s event really marks, or rather reveals, is something Marshall McLuhan observed decades ago: The content of the new media is the old. It also reveals something about the nature of the commodity that Marx observed over a century ago, that the commodity appears initially as an obvious, trivial thing, “but its analysis brings out that it is a very strange thing, abounding in metaphysical subtleties and theological niceties.” Remember that the media loves singular dates as much as it loves anniversaries: it provides ready-made content that can be repackaged as “news,” as novelty. The 40th anniversary of Woodstock came and went; this day, too, shall pass, with neither bang nor whimper.